Oakley Property are thrilled to be opening the doors to two truly unique new homes. One of our latest new homes project is positioned in the popular village of North Chailey just outside Lewes. “I have the pleasure of working on some wonderful projects and Bevingdean Copse certainly doesn’t disappoint! The first thing you notice is the striking design. The architect has managed to incorporate traditional high quality materials into a fabulous 21st century take on a barn. At circa 3,300 sqft they are substantial houses and lend themselves to a range of buyers and lifestyles”. 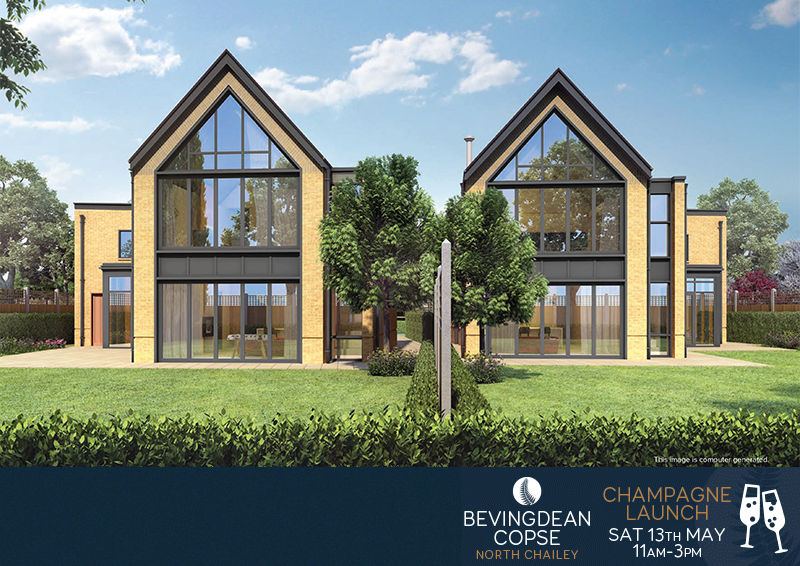 Bevingdean Copse has been designed for sustainability and modern living from the outset and to achieve this the developers County Gate Properties have brought together talented designers working on each aspect. David continued “The houses enjoy views to Chailey Common at the front and the South Downs at the rear. Bevingdean Copse has been designed to take full advantage of the magnificent views including a vaulted living room at first floor with full height glazing”. What does life in Chailey have to offer? Bevingdean Copse is situated to the south of the village on the edge of the beautiful Chailey Common. Haywards Heath to the west offers a wide range of amenities and excellent mainline railway links to London, Gatwick, Brighton, Lewes and Eastbourne. A choice of wonderful country pubs abounds with one of the best places to eat the nearby Five Bells. While the lovely village of Newick offers a doctor’s surgery, bakery, chemist and pubs situated around the village green. The historic County Town of Lewes is approximately a 15 minute drive to the south and Brighton is around another 15 minutes from there. The area is extremely well served by excellent local schools and nearby Sheffield Park Gardens provide a wonderful 250 acres of landscaped gardens bordered by historic parkland and woodland to explore. This together with the Bluebell Railway offers a special day out. The developers have carefully designed the bath and shower rooms using high quality white sanitary ware with striking Hansgrohe chrome taps and showering accessories. Each property features an individually designed contemporary Italian Kitchen by Stosa Cucine, combining fabulous style with function. These beautiful new homes are being offered at a guide price of £1,295,000. They must be viewed to be appreciated and the Oakley team invite you to come and join the champagne launch on Saturday May 13th 11.00 – 3.00. There is no appointment required, you can just come along on the launch day. Alternatively, if you wish to book a specific time, request a brochure or discuss in more detail please call David Beaken on 01273 487444 or email david@oakleyproperty.com.